This week was Tim’s turn to choose the topic. He went for cover songs. I really love this topic. 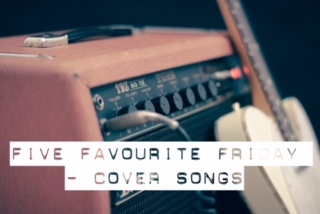 There are so many cover songs that I love and I couldn’t wait to write my post. I know that there is going to be huge differences of opinion between us this week. 5. Wagon Wheel – Darius Rucker. Originally by Old Crow Medicine Show, released in February 2004, this song has actually been covered quite a bit. But this version is my favourite. 4. Only You – The Flying Pickets. This was originally by Yazoo and was released in March 1982. The Flying Pickets version is so good. If you haven’t heard it, listen to it. Do it. Do it now! 3. Whiskey in the Jar – Metallica. Thin Lizzy did this one back in 1972. However, they are not where the song originated. The song is actually a traditional Irish song about a Highwayman who is betrayed by his lover/wife. I actually didn’t know this until doing my research for this post! 2. Working Class Hero – Green Day. A cover of a John Lennon song, originally released in 1971. Another that you should listen to now if you haven’t already heard it. Such a beautiful song wonderfully covered. Kudos Green Day, kudos. 1. Iko Iko – Sia, Jimmy Fallon, Natalie Portman & The Roots. I was going to have Cindy Lauper as the artist for this one but then I remembered when Sia did the song with Jimmy Fallon on The Tonight Show. It is incredible! Here’s the video if you haven’t seen it already. Normally I would do a list of honourable mentions but in this post I need to do a special mention. This is a song which I really wanted to include in the top 5 and deserved to be there. But I had no idea where to put it. It’s such an amazing song, originally by Nine Inch Nails. Hurt was redone by Johnny Cash and is one of the best cover songs ever produced. Cash recorded the song in 2002 and then in 2003 he recorded the video for it. He was of poor health at the time and it shows in the video. Seven months after shooting the video, Cash sadly passed away. My special mention in this post is my tribute to the legend that is, Johnny Cash. What are your favourite cover songs? Let me know in the comments!